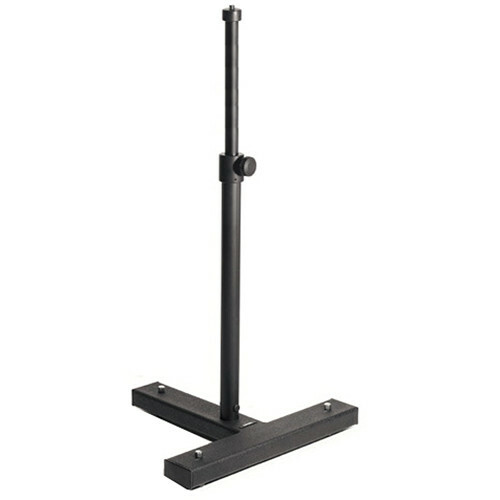 The Solo Stand from Cambo is a studio stand ideal for portrait photographers using DSLR or medium format cameras. The stand is made up of a column and a T-shaped base. The column extends from 32.3" to 52.0" making it easy for the photographer and/or the subject to switch between sitting and standing positions. A shock-absorbing spring in the column provides a buffer, protecting your camera from damage. On top of the column is a 3/8"-16 studded camera mount which allows you to mount a tripod head or other accessory like a cross arm to your column. The welded steel base has three lockable swiveling castors, allowing the stand to move easily over smooth surfaces. Box Dimensions (LxWxH) 45.0 x 21.5 x 11.0"
What is the size of the footprint for this stand? The footprint is roughly 2 square feet.